This morning -- the week after a mass shooting by a white supremacist took the lives of 49 people in New Zealand -- police in Charlottesville, Virginia, arrested a 17-year-old boy who made threats on a 4chan message board. In a post, the suspect announced his plans to "ethnically cleanse" Charlottesville High School of minorities, telling white students to stay home. The post came to police attention when it was published on the Charlottesville Reddit board, and the school has been closed today and yesterday as a result. As you surely recall, in 2017, Charlottesville was the site of the notorious Unite The Right rally. Virginia police have also arrested an Albemarle County student who made a similar threat on social media on Thursday night to commit a mass shooting at his school as well. Police have not yet determined if they were related, or if the Albemarle student was simply a copycat. The charges faced by both students can result in up to five years in prison and a $2,500 fine. Charlottesville Police Chief RaShall Brackney said of the arrests, "Hate is not welcome in Charlottesville. ... And we stand firmly in stating there are not 'very fine people' on both sides of this issue." That is a good take, and I'm glad they're taking this seriously. But there is still a problem here. Police only found out about this threat because it was posted to Reddit, where it then received further attention. Had that not occurred, had someone not in law enforcement not bothered to do that, the school might never have been closed, and the shooter may very well have gone through with his plans. It would not be the first time that had happened. In 2015, incel murderer Christopher Harper-Mercer announced his plans on 4chan's /r9k/ board prior to killing nine people and injuring nine more at Umpqua Community College in Roseburg, Oregon. In 2014, 33-year-old David Kalac murdered his girlfriend and then posted pictures of her dead body on the site. Just last year, Eric M. Radulovic was arrested for having posted on 4chan that he planned to shoot and kill protestors at the Charlottesville Unite The Right rally. In 2013, multiple Dutch schools had to close after mass shooting threats were posted to 4chan. There have been multiple other threats and hoax threats associated with the site since its inception. How much more obvious can these people possibly be? Do they need a flashing neon sign saying, "Hey, we brag about committing and planning to commit crimes here"? It should not be up to regular "concerned citizens" to publicize these threats so that police can do something about them, so that schools can shut down. If it were any other group of people, law enforcement would be constantly monitoring these kinds of sites in order to track threats made in specific areas. Take a moment and just try to imagine law enforcement being super chillaxed about a site with this kind of rhetoric and reputation were it populated by Muslims or black people or anarchists rather than simply "angry white dudes." They'd be on them 24/7, and any person found cheering potential murderers on and not reporting threats would be arrested and charged as an accessory or on RICO charges. Alas, we don't really have funding for that kind of thing these days, given that Trump has shut down programs meant to counter violent domestic extremism. It also becomes harder to take this kind of rhetoric seriously when Tucker Carlson is on the television every night repeating similar talking points, when people on Infowars are going, "Sure, it was probably bad to kill 49 people, but that shooter sure did make some great points in his manifesto about how Muslims are bad and liberals are trying to 'replace' white Christian men with immigrants!" Or when James Woods is going around tweeting out 4chan conspiracies. None of this exists in a vacuum, and 4chan isn't the only place where these kinds of racist views are becoming normalized. We have a situation here where, at the very least, a 17-year-old boy is immersed enough in this culture to think it is OK to go online and threaten to ethnically cleanse his school. That is fucked up. As I am writing this, there are multiple threads up on 4chan's /pol/ board celebrating mass murder and those that commit mass murder. There is a "say something nice" about Timothy McVeigh thread, there are "jokes" about bringing pressure cookers to mosques. There are multiple misogynistic, anti-Semitic, Islamaphobic, racist threads. In fact, that's all there is there. For all intents and purposes, it is a cult that is drawing angst-ridden white men to extreme bigotry, misogyny, and violence. Maybe they won't all go and commit a mass murder, but that doesn't mean they're not dangerous. You put a bunch of damaged, angry people in a room together, where the more awful things they say or threaten the more positive feedback they get, and things are not going to end well. They're all going to keep trying to outdo each other and they're going to get worse and more detached from reality than they were before they stepped in. 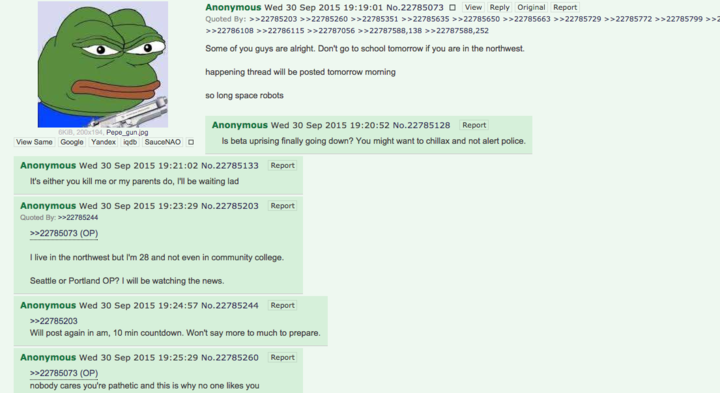 Almost every time there is a mass shooting, there are threads on 4chan and 8chan cheering the shooter on. The most recent mass shooting in New Zealand was no exception. After videos of that mass shooting appeared on 4Chan and 8chan, New Zealand decided to block access to them entirely, just like they immediately cracked down and banned semi-automatic guns. While it's unlikely that kind of thing would happen in America, it sure would be nice if we could start taking it a little more seriously.